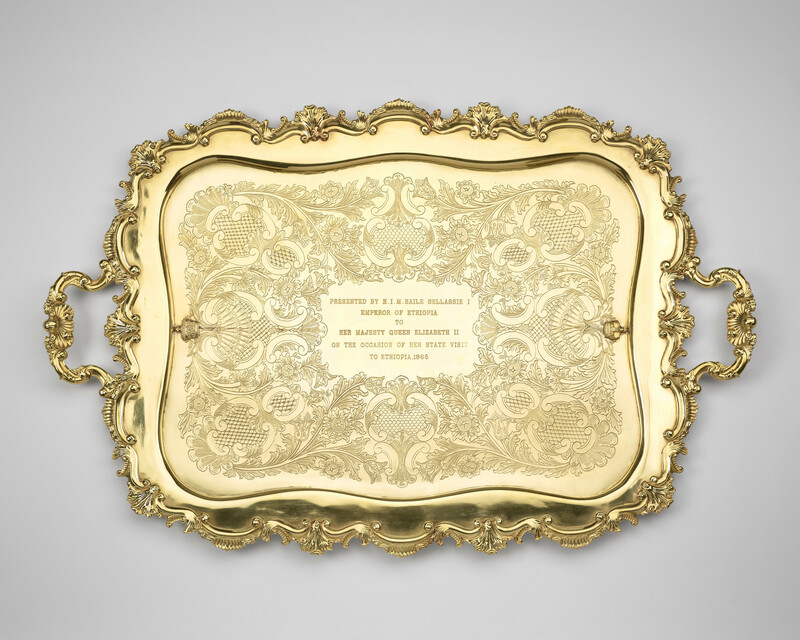 An Ethiopian gold tray; rectangular with rocaille scroll rim and lateral handles; engraved in centre with wide band of scrolling foliage, flowers and rococo cartouches, applied with Ethiopian Imperial crown at one end and British crown at the other. Emperor Haile Selassie employed the goldsmith Bedros Sevadjian to create some of his diplomatic gifts, including insignia; The Grand Cross Order of Solomon's Seal, The Star of Ethiopia Grand Cross, The Order of the Star of Ethiopia and The Order of The Queen of Sheba. Sevadjian received his warrant to work for the Emperor in 1950.